M&D Enterprises also offers Triplecreek blinds manufactured by KanTex! KanTex Manufacturing wanted a Deer Blind that would stand up to the rigors of being out in the environment 24/7/365 in all areas of the country, and in any kind of weather - from freezing winds, rain, ice and snow, to blistering sun and heat. 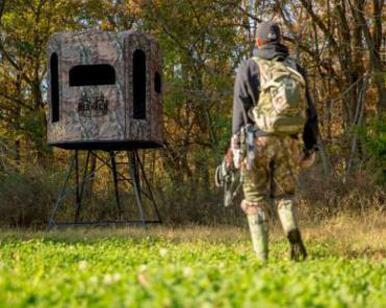 Not only should a deer blind be expected to last a lifetime, but it should also offer the necessary features for successful hunts, while keeping the hunter as comfortable as possible. You can click on the picture, call, or email for more information and pricing about KanTex manufactured deer blinds.